Katie Beth is doing great. The drive has been nice and the weather has missed us so far. 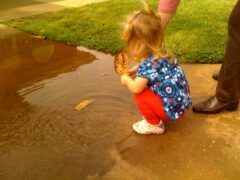 We are burning off more energy here as Katie Beth plays in the water with the leaves.